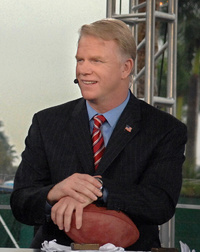 Norman Julius "Boomer" Esiason (born April 17, 1961) is a retired American football quarterback and current network color commentator. He played for the National Football League's Cincinnati Bengals, New York Jets, and Arizona Cardinals before working as an analyst for ABC and HBO. He is currently an analyst for CBS Sports primarily on The NFL Today, as well as morning co-host on New York radio station WFAN and Monday Night Football analyst for Westwood One. This webpage uses material from the Wikipedia article "Boomer_Esiason" and is licensed under the GNU Free Documentation License. Reality TV World is not responsible for any errors or omissions the Wikipedia article may contain.